Last year (oh, wait, in 2012—gosh) I wrote about the sorry state of affairs of the MBTA's commuter rail system. Outside of rush hour, trains travel infrequently and on seemingly random schedules. Even in closer-in, denser areas, service is provided only every couple of hours. (Oh, yeah, and service is slow, too.) There is probably demand for better service but little supply, and it's partially a cost issue: running full, 1000-passenger commuter trains (with poor acceleration) is a losing proposition when few seats are filled. If implemented, this would go a long way towards improving service on several underserved corridors. The Fairmount Line currently is served infreqently by full-length commuter trains, a complete mismatch of service. Lower capacity and better acceleration would provide a much better benefit there. The Worcester Line—which will soon have added service—provides very little service in Newton, the most densely-populated portion of the line (it is served by express buses, which crawl through traffic on the Turnpike). Better service to Lynn will provide some of what a far-costlier rapid transit connection would—faster and more frequent service to Boston, and service to Woburn will provide better connectivity north of Boston, as well as further reducing the run times for trains to Lowell, currently one of the faster trips in the system, and one which, if the state of New Hampshire pays, could be extended northwards to the granite state to provide an alternative for the traffic-choked I-93. The most interesting piece here is the inclusion of the Grand Junction through Cambridge. This page would argue for a complete rebuild of this line, with grade separation and electrification, and its operation as a crosstown link between North Station, Cambridge and Allston, currently a serpentine trip by car, much less by transit. It also would provide better access to the fast-growing Cambridge area which is currently poorly-served by highways and at the whim of the over-capacity Red Line. Currently, commuting from west of Boston to Cambridge is a bit of a black hole; there is no good connection between the Worcester Line and Cambridge without going all the way to South Station and backtracking across the Red Line. The Grand Junction is an underutilized piece of infrastructure which could be put to very good use. What really matters is how the MBTA decides to implement DMU service. (That is, if it can be funded and overcome local opposition; double-dipping Cambridge City Councilman and State Rep Tim Toomey helped to quash a plan to route some commuter service over the Grand Junction in 2010. Needless to say, he did not receive my vote in recent council elections). If it uses it as a cost-saving measure to run the same level of service with less equipment, it will simply maintain the status quo. For instance: there are only eight commuter rail trains from the stations in Newton to Boston daily. And the Fairmount Line has 60 minute headways with no evening or weekend service. Running the same level of service with different equipment would be a wasted opportunity (if a minor cost savings). If the state provides faster and more frequent service to these lines, say, with 15 or 20 minute headways all day, it will come much closer to providing a transit level of service, and actually providing service to these communities. With new stations at Yawkey, near New Balance and the intermediate "West Station" the Worcester Line would provide better connections through an underserved portion of Boston and Newton (with frequent, timed shuttle service across the Grand Junction a dramatic bonus). And the Fairmount Line, which currently provides piss-poor service to one of the states most disadvantaged communities, could prove an economic lifeline, if only the trains ran more than hourly. And if DMUs are successful, they could be implemented in other parts of the system. Why run a full trainset at off-peak hours from Newburyport to Boston when a transfer at Beverly would provide the same level of service? Perhaps instead of the hourly locomotive-hauled train from Boston to Lowell, half-hourly DMUs would double the service at a minimal additional cost. Perhaps DMUs could provide service further west of Worcester to Springfield and Amherst. Hopefully, the state sees DMUs as a tool, not as a cost-cutting measure. If they implement this service better than they photoshopped the map, they could dramatically improve travel in Massachusetts. Having more frequent and more flexible service on the commuter lines is a great idea, and might even save money if the vast fleet of buses stuck in traffic on the Pike is replaced by a much smaller fleet of trains on the Worcester line (it would only take three or so), though that would require a station at Newton Corner, which doesn't seem to be in any plans. But I'm still vaguely annoyed by the MBTA's strongly anti-electrification stance. EMUs have even better acceleration than DMUs, plus they're quieter and don't produce point-source pollution in the areas they serve. Interestingly, the preferred alternative for South Coast Rail is electric, yet as far as I know, there's no thought being given to electrifying any of the commuter rail system, including the Providence line. It's a good question about electrification and one which comes down partially to obstinacy, and partially due to money. On the obstinacy front, the T doesn't want to run multiple power modes, just diesels (although DMUs are a step in the right direction). I would concur that having a set of electric motors or multiple units to run from Providence to Boston would make terrific sense, especially if they could get cars rated for 125 mph and run at MARC speeds on some faster runs, and with good acceleration on the slower ones. The second is that electrification anywhere else costs. A lot. The Amtrak coast route electrification cost $2.5m per mile in 2000, so figure quite a bit more than that. $5m per mile? Add to that the cost of substations, bridges (wires take up space, and if clearance is minimal, you have to lower the track bed or raise the bridge) and assorted infrastructure, it's not cheap. $2b minimum for the whole system, and even electrifying, say, Worcester and Lowell would cost half a billion. If you have a $2 billion budget for a system with 80 locomotives, that works out to $25 million per locomotive, which at Tesla's $250/kWh for stationary storage, would mean 100 megawatt hours of storage per trainset. That's equivalent to running an Amtrak P42 at full throttle for about 32 hours, and obviously there is no point in putting such a large battery on a commuter train. Given those numbers, I can't imagine that stringing overhead wires over the whole length of a commuter rail system makes any sense these days. Regarding electrification, I've always thought that a rolling, incremental electrification program was the right move. Start by buying some electric locomotives for the Providence line, which is already electrified, and electrify any "missing tracks" on it. - Next, buy some more electric locomotives and electrify the Stoughton branch. Create an electrified district and expand it slowly, so that as normal locomotive replacement is necessary, diesels can be replaced with electrics. The north side would take a very long time to be electrified under this plan, but it would happen eventually. I agree, sort of. But first, the T should a) get what they have a bit more reliable and b) figure out how to manage a contract for new equipment so you don't wind up with Rotems that don't work the day they are delivered. As I mention above, though, buying some electric motors or EMUs to run on the Providence line shouldn't be too hard. Next time MetroNorth, NJT, SEPTA or MARC buys something electric, piggyback off that order. It's probably not too late to get some M8s while the production line is still running, and certainly not too late to get in on Amtrak's locomotive order, or maybe even buy secondhand HHP-8s from Amtrak (or MARC). Of course M8s need high platforms, which would require its own relatively expensive construction but that would be a huge benefit to reliability and speeding up peak service, as well as cutting staffing: how many conductors do you really need, when there aren't trap doors to operate? Well, you could have full high platforms on the Providence Line with five station upgrades: Hyde Park, Canton Junction, Sharon, Mansfield, Attleboro and South Attleboro. The rest of the stations are full-length high platforms already. That would be good bang for your buck, too, as those are some of the most heavily used in the system. Level boarding could probably save 1 minute at each just in dwell time. Amtrak regionals are scheduled in 32-35 minutes from BBY to PVD. An express electric train with level boarding could probably make the run in 45 minutes; versus an hour now, minimum. The plan to create a new “West Station” and expand high frequency DMU service on several lines seems reasonable and will fulfill many of the goals which were originally intended to be fulfilled by the Urban Ring BRT proposal. However, there is one large gap in the DMU proposal, which is the BRT connection between Harvard Square and Dudley Square. In many ways, this was the most critical link in the Urban Ring BRT network, and it was unfortunately left out of this proposal. An Urban Ring line from Harvard Square could run on surface streets form Harvard to the new West Station, and it could then enter a tunnel which would cross underneath the Mass Pike and the commuter rail tracks. The tunnel could then continue under Babcock Street until it meets Comm Ave, and then run underneath Comm Ave to Mountfort Street, where it would then turn and run along Park Drive and Ruggles Street to Ruggles Station (It could also offset into the center of Longwood if required). The line could then run above grade on Melnea Cass to Dudley Square. 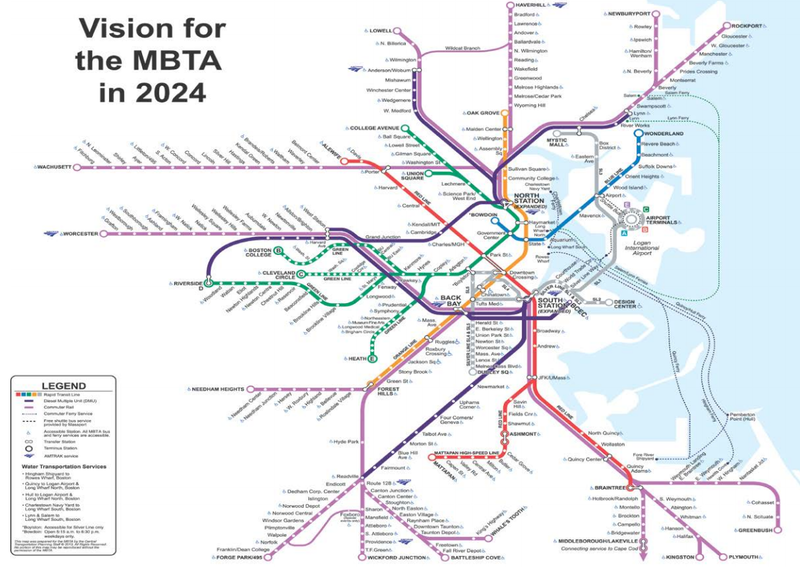 This configuration would connect the Red and Orange Lines with all four branches of the Green Line, as well as the Silver line and multiple commuter rail lines. As a result, it would direct a significant amount of traffic away from the downtown area, and provide many more options for transit commuters. The problem with buses in tunnels is capacity. Look at the Silver Line. A 60 foot bus can hold 100 people. Three 75 foot light rail vehicles can hold 400-500 people. A string of Red Line cars can hold 1000. This is the sort of route that would be highly-used from day 1. We should not hamstring ourselves by building another Silver Line. BRT has its place, but once you start digging tunnels, you might as well run rail through them. There are many great solutions already listed here. As many of you have already mentioned, I have always thought that a phased electrification of the Commuter Rail made the most sense. I also agree that implementing an Urban Ring that services all core lines would be expensive but not impossible. Obviously, the Silver line, in its present form and function is grossly inadequate but that is not to say that BRT is the wrong method. Some of the large "bi-articulated" hybrid buses in production today are rated for up to 200 passengers. Examples from manufacturers such as Bombardier are introducing rapid conductive charging systems that will minimize the need for catenary and/or diesel use. The above suggestion of a maximizing on the existing infrastructure to utilize tunnels, new or existing, as well as dedicated roadway lanes (isolated by permanent barriers when possible) could add a more cost efficient answer to the Urban Ring and North / South Connector needs. An obvious example of improvement may be by revamping the Washington St corridor with stylized lanes separated by concrete barriers with improvements to the stops along the way such as prepay, better environmental protection, the conductive charging systems, etc. Eliminate the foolish loop through Downtown Crossing and utilize one of the conduits already built into the South Station Silver line terminus. Access is extremely difficult to this hub from above grade but possibly routing through the southern portion of the USPS Annex along Dorchester Ave. There are countless suggestions for the Ring but I would propose (in general terms) the following; South Station (Financial) - Greenway (Aquarium / Quincy Market) - North Station - Science Park - Union Sq - Harvard - Western Ave (Allston) - Coolidge Corner - Longwood Medical - Ruggles - BMCM (BU Medical) - Chinatown (NEMC) - South Station. The big omissions are the Seaport, Eastie and Logan. Forcing all Ring traffic through Logan via the Seaport would add a significant extension / delay to the overall trip. Utilizing the dedicated transfer spur at South Station as a connected but separate line within the Ring would still allow much improved access across all Mass Transit Lines - South Station (Amtrak & Commuter Rail, MBTA & Commercial Bus Lines, Red-Line subway and nearby commuter boats), North Station (Amtrak & Commuter Rail and subway), Logan Airport, Greenway (commuter boats). I apologize for the novel. I really did start my reply with one or two comments. Battery powered EMUs ought to be the way forward.